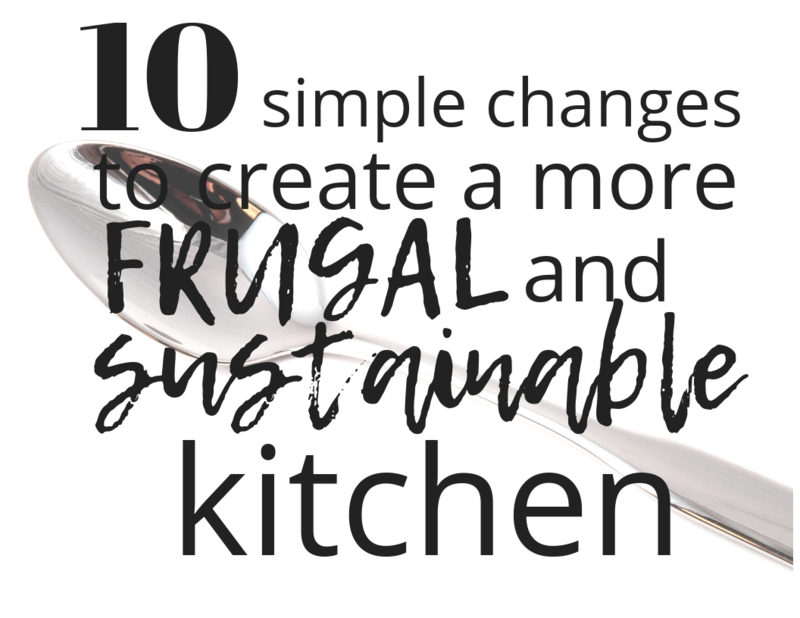 If you are trying to be frugal and more sustainable and still have a full functioning kitchen that you can use, I’ve got it all for you. I spend most of my day in the kitchen. Meal prepping is a must-do in our house and it’s very rare for me not to make an entire meal from scratch. Not only am I a big cook, but I work from home and the kids are homeschooled. This means I need a kitchen with all the essentials that doesn’t take up a ton of space or dwindle our family’s budget. So, I decided to share all the little ways I have made a smaller, less expensive kitchen work for me. Not only that but, I aim to keep things more environmentally friendly as well. Here are some of my personal choices for a more frugal and sustainable kitchen. Tom and I have gone through so many blenders in our life, it is absolutely ridiculous. About 3 years ago my mom gifted us a NutriBullet and we couldn’t have imaged that the smallest, simplest and (one of the) less expensive blenders would achieve literally everything we have ever needed in the kitchen that no other blender was able to do for us. Now this one I am still on the fence about. When it comes to cook time, I hear the Instant Pot is unbeatable. Although I have also heard the temperatures can get dangerously high. Truthfully, I don’t usually mind allowing food to slowly cook in the crock pot all day and don’t usually have to speed things along. Getting an Instant Pot would be a big investment that I just don’t know that I need. It does boast that it uses less energy which I love, however, have heard contradicting arguments that the high temperatures actually end up using a lot of energy. So when it comes to this one, I’m in a pickle. This is where you come in. Feel free to head to the comments and give me your opinions on which one you believe has been the best for you and your family. Our family has found a pretty good balance when it comes to the use of the dishwasher. Because we are a family of 5 and throughout the day 4 of us are usually home we tend to dirty a lot of dishes. We also meal prep like crazy and take full advantage of our pots and pans. Instead of spinning multiple loads throughout the day, we wash our plastics, pots and pans in the sink by filling one side like a sudsy tub. This stops us from running an extra load and wasting water. My step dad originally was the one who introduced me to the idea of a “sink tub” to cut back on water waste and it’s something we have passed on to our kids as well. To save space on our counter tops and keep things looking clean, there are great in-the-sink dish dryers. These can be used on the other side of your sink to neatly store washed dishes and allow them time to dry. Plastic bags are my mortal enemy. They are terrible for the environment and they can so quickly take over my kitchen. So many places these days have reusable bag options and often offer discounts for using them. Check out some of these seriously adorable reusable bags that are capable of fitting absolutely everything you need into them! As a kid, my family used to use reusable plates and now they are something that we have basically forgotten about all together. Yes, clean up would be easier but it’s a huge waste of environmental resources, and can end up causing you to throw away more garbage bags at the end of the week. I know most people are turned off to the idea of having more dishes to do. But really, what’s a few plates? When it comes to you and your family at dinner time, using paper plates really won’t cut back on dishes time or water wasted. At least not by much! Again, paper towels are something that are basically obsolete in our house. Anytime I needed to wipe my hands off, especially when cooking, I tended to use our nice towels or I’m constantly turning the water off and on. That’s when I got these amazing flour sack rags. They are thin, easy to store and super easy to grab and use as a rag. Whether you like to clean your hands or tidy up the counter tops, these versatile rags do it all. They are easy to wash and because they are so thin, they take up very little room. Chances are, you have heard about the downfalls of using plastic. Things like BPA that are bad for you and all the rest that is bad for the environment. Not only does switching your water bottles to a glass reusable bottle save both of these, but it also encourages water drinking and cuts back on the amount of dishes at the end of the day. Everyone in our family has their own water bottle to drink from throughout the day. It helps huge in keeping everyone hydrated and we don’t mix up whose cup is whose. Yes, I am one of those people who washes Ziplock bags. We do use them on occasion for freezer storage but have made a huge effort to cut back on the disposable plastic storage options in favor of more high quality storage containers. The initial investment will of course be bigger, but has the potential to help your food last longer and cut back on waste. A downfall os this is of course needing to find more room for storage. Personally, I am OK with a one time purchase that I feel is better for the environment and ultimately the better choice in the long run. Because we spend so much time in the kitchen, these reusable liners have been helpful in more ways than one. Obviously, the main use was for making cupcakes and muffins without having as much waste at the end. The other great thing about these liners is that you can also use them as snack containers or separators in the kids’s lunch bin. These work perfectly for breakfast muffins or make ahead omelets! For the longest time I wanted a Keurig coffee maker. They are so fun after all! I love he K cups and the variety of options that come along with it. Since they are a bit of an investment, it kept getting delayed since it wasn’t a priority in our house. I’ll be honest, at the time I wasn’t a big coffee drinker. I just liked the hot chocolate, tea and a few more sugary coffees. Wouldn’t ya know it I started liking coffee more and more. I was stopping a few times a week at the gas station to get a cup. Instead of wasting money by always being a single cup of coffee, I decided it was time to invest in a small, simple coffee maker. Plus, makers like this single cup maker can be really wasteful when it comes to the amount of K cups that are wasted. I’m so glad to hear they have reusable cups now, but I can’t help but think most people don’t use them. Especially when they make buying so many fun varieties so easy! Coffee filters on the other hand can be easily composted, therefore they add no additional waste. These are some of the switches that we have made over the years that have wound up sticking. I would love to hear from you guys, what frugal kitchen switches do you swear by? Nice tips! I was on the fence about the Instant Pot as well but got one for Christmas and am in love with it. Oh, good to know! Thanks for weighing in! I love everything about this! We’ve kind of done the same thing in our house over the years. We’re really concerned about the environment and try to make as much of our kitchen use as sustainable as possible. I saw you’re on the fence regarding the Instant Pot—go for it! The speed, ease of cleaning, and versatility are what make it worth it. I’ve made everything from a whole chicken (from frozen to ready in an hour!) to amazing soups and curries. It also serves as a rice maker and yogurt maker, if you’re into that. Also, I completely agree with you when it comes to Keurigs. I’ve never liked them! They don’t make good coffee, and are so wasteful. I’m a big coffee person, so I opted for a Chemex with a reusable cloth filter. I’m sure they have reusable filters for regular coffee makers as well! You just have to boil them once a week to get the coffee oils out. Great job on your frugal makeover! Thanks so much! I have been meaning to get the reusable filter for our coffee maker as well. Since it’s so small, they don’t carry them in most stores! Amazon to the rescue! I love that frugal living is also usually very environmentally friendly. My family and I are working towards a more zero waste friendly lifestyle and we have made some of the very same swaps you mentioned in the post! My favorite switch has been from single-use paper towels to reusable ones. We found some bamboo ‘paper’ towels and they are AMAZING. I can’t imagine going back to paper ones. I haven’t jumped on board with the Instapot yet, but I LOVE my crockpot! Wow! Haven’t heard about those! I love my crock pot too…got it going right now! Whoop whoop! This are such great tips, I have a smallish kitchen and these could be really useful! I haven’t ever used an InstantPot, but my crockpot is a live-saver in this house, I don’t think I could part with it. Oh wow this is a great read, I personally have to work on using less paper towels there is one piece at every corner in my kitchen and such a waste. thanks for sharing. Such a great post. You have really helped me think about the changes I could make. Thanks. I’m so glad! Thanks Fiona. In a house, having a big kitchen is basically and MUST HAVE! And now because I need endless appliances and disposable items, but because I like to have a lot of space to cook. I love all of your choices because their necessary and I can’t stand over-cluttered kitchens that have so many appliances that basically do the same things. I love this post so much! Thanks for sharing! I get ya! I spend all day in my kitchen gotta have it be high functioning! Thanks so much Kasia! Glad you’ve found these products that work so well for streamlining your kitchen! I do like my crockpot–I like that I can have dinner ready even when I’ll be away from home for hours at a time. I do use paper towels for some things–if I fry bacon or chicken, I prefer to drain the grease out onto a paper towel before serving, but rags are better for actual cleaning! I even use my rags for bacon too! They get the job done. I Love my Instant Pot. I still use my crockpot, I find myself reaching for the Instant Pot more often. The time it saves is amazing! Thanks for the input Rachel! I’m sure I’ll make the transition at some point. this is so great! We also don’t use paper plates, or paper towels in our home. – it saves money and the environment! I really like these tips. Our biggest problem at the moment is going paperless. Well good luck as you make the changes! I recently forced my family to start using cloth napkins instead of paper towels. My kids were easy converts but my husband was against me. Now that we’ve officially switched I feel SO much less guilty! It’s so silly the little battles we have to go through. This is such a fantastic list! I love those reusable muffin tin liners; I use them to mini egg bakes. They work so well. Plastic bags are my mortal enemy, too. I’m excited because our city just went plastic bag free, so now every store provides paper bags instead of plastic. It’s awesome! That is awesome! I would love to see that happen in our city!